This is a tiny fingertip squeeze bubble blower. The green bulb is made from rubber which is showing its age. The included clear glass bottle has no markings on the side or lid; on the bottom it has the numbers 182 and 3 and has a mark. 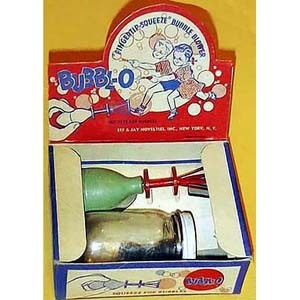 1--Hold BUBBL-O in hand, touch solution lightly with BUBBL-O Ring. 2--Allow excess solution to drain off ring. 4--DON'T draw solution into bulb. DON'T submerge ring below surface of solution.